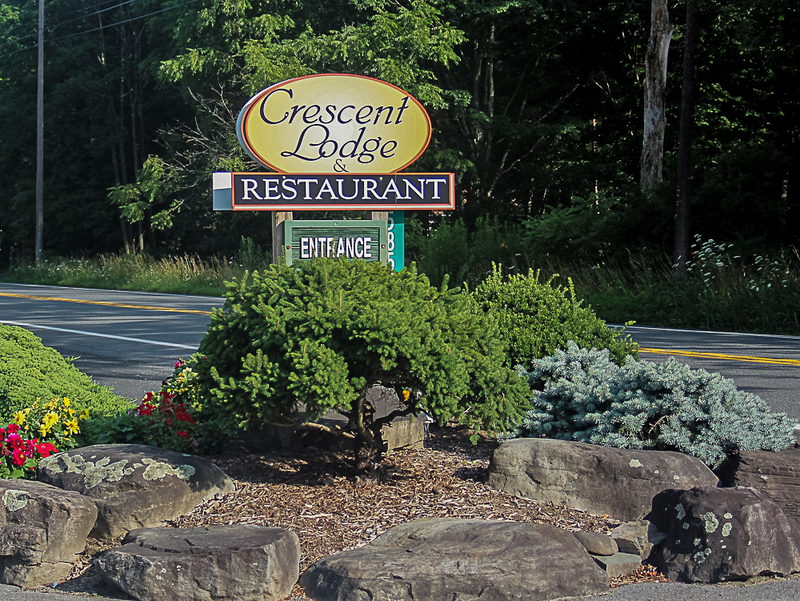 The Crescent Lodge has been a thriving Pocono Mountain’s business for decades. The Crescent Lodge, 5854 Paradise Valley Road, Cresco, Pennsylvania epitomizes extraordinary cuisine, quaint lodging options, personalized service and relaxed atmosphere. If you’re looking for an adult-only getaway, this family-owned resort offers a perfect setting for you and your partner to reconnect. 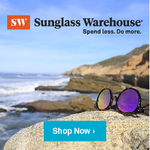 Business travelers will also soon discover upon their arrival that while a life on the road can be lonely, they will feel welcomed by father and son team, Bob and Wayne Dunlop. The Dunlop’s have lovingly maintained and updated the lodge and its guest quarters to stay in sync with their guests’ needs. The Dunlop family’s antiques, vintage memorabilia, a collage of Bob Dunlop’s cherished photos and comfortable seating around the hearth add a personal touch to the lobby. Be sure to look for Bob Dunlop’s wall of photos. A personal touch and comfortable furnishings offer a vintage feeling that beckons guests to relax. Lobby at Crescent Lodge & Country Inn. Photo by Joan Mead-Matsui. On a warm summer morning, you will want to sip your first cup of coffee on the deck. Begin your morning relaxed and carefree and then find your way to breakfast at the inn across the way. Birchwood Jacuzzi Cottage: Take note of the spacious deck equipped with comfortable outdoor furniture, where you can relax after a busy day of golf at a nearby course, sightseeing and shopping, hiking at the Delaware Water Gap recreation area or fishing in the Delaware River. Photo by Joan Mead-Matsui. Birchwood Jacuzzi Cottage: Photo by Joan Mead-Matsui. The Birchwood Cottage is one of the lodging options available to guests. This home-away-from-home is well-equipped both indoors and outdoors. A king size bed, see-thru fireplace, sunken Jacuzzi, living area, cable TV, mini-fridge, coffee maker and private bathroom in the Birchwood Jacuzzi cottage are all the comforts you’ll need. Slip into one of the complimentary robes provided in your room, fill the Jacuzzi tub and soak ’til your heart’s content. Wood shingles embellish the exterior of the custom built cottages. Photo by Joan Mead-Matsui. The décor inside this custom crafted bungalow is equally as enchanting as the exterior façade. Dunlop, an architect, and his father built each of the cottages as spacious retreats from the hustle of everyday city life. All of the cottages at this adult-only inn are perfect for retirees, newlyweds and business travelers. On-site trails at Crescent Lodge and Country Inn. 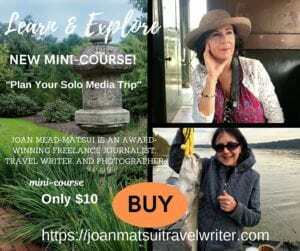 Photo by Joan Mead-Matsui. The pool is a welcome amenity on a balmy summer day, but many guests find poolside is a refreshing spot to have a cocktail before and after dinner. Plan a return trip to the Crescent Lodge in late September or early October if you want to witness the splendid fall foliage in the Pocono Mountains. Even on a warm summer evening, a crock filled with savory French Onion Soup is a perfect beginning to your meal. On a warm summer evening, Bob and Wayne Dunlop greeted their dinner guests. The parking lot was packed with cars and there wasn’t a vacant table in the dining at 6 p.m. What makes this Paradise Valley dining option so popular? Personalized service is a long-standing family tradition that began in 1947 when the Dunlop family purchased the former boarding house known today at the Crescent Lodge. If you arrive with a voracious appetite, you won’t leave hungry. The menu features American cuisine that’s expertly prepared. Portions are plentiful, so you’ll most likely leave with a “to go” container. If a light fare is more to your liking, try an appetizer like the French Onion Soup, which is almost a meal in itself and made with a flavorful and aromatic broth. A Caesar Salad is a perfect accompaniment to the soup. Click here (http://www.crescentlodge.com/restaurant.html) to read a sample menu. On weekends, you’ll dine accompanied by live piano music. More information regarding lodging and special packages can be found at crescentlodge.com.